Kdan Mobile announced today that it will hold a series of events from April 5 to April 13, 2012 in celebration of its third year anniversary. The Company will launch a four-day sale on all of its apps, and the discounts will range from 40% to 60%. Kdan Mobile will also give away promo codes on its Facebook page. In addition, the company will host the “Roll a Dice, Win Great Prizes” sweepstakes on its brand new official website, offering a chance for all participants to win the new iPad. 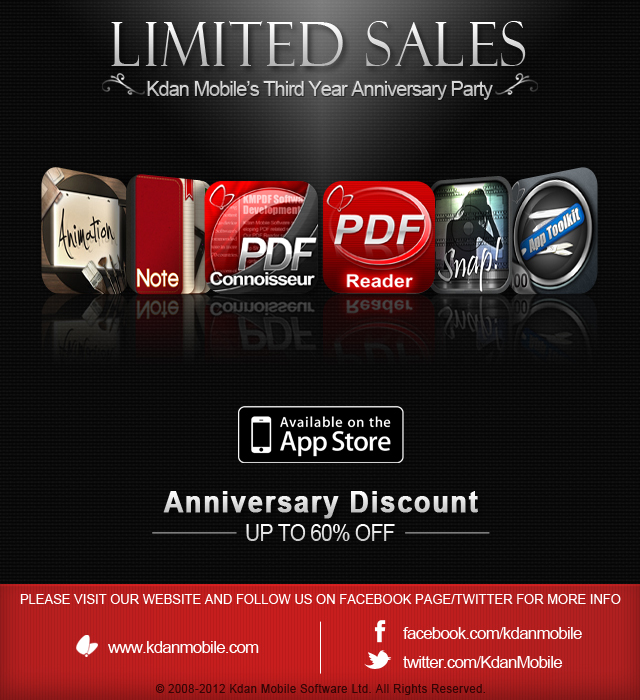 Kdan Mobile’s third year anniversary celebration includes three major events. First, the company will offer a four-day discount on all Kdan apps such as its famous PDF Reader series, Animation Desk, and Pocket Snapper. “The discounts we are offering not only marks our achievement in this competitive industry, but also gives customers a better chance to appreciate what we have done to enhance the quality of their lives,” said Kenny Su, CEO of Kdan Mobile. On April 5 and April 13, the Company will also give away promo codes of Kdan’s apps on its Facebook Page to thank the ongoing support of its fans. 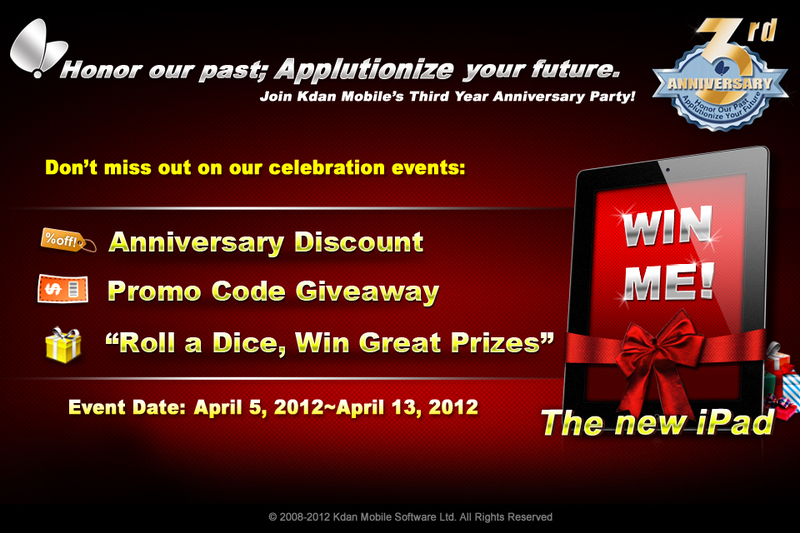 In addition, Kdan Mobile is hosting the “Roll a Dice, Win Great Prizes” sweepstakes, which runs from April 5 to April 13. Participants can roll the dice on Kdan Mobile’s official website to win the new iPad.